I've had a thing for lavender beauty products for a while now. I think it started when I saw girls wearing lavender blush in Japanese magazines - it just looked so cute! 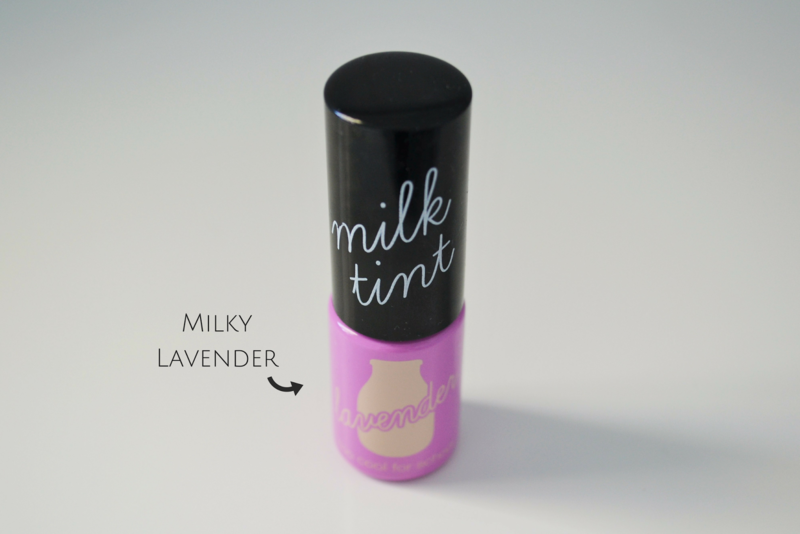 While I haven't been brave enough to try lavender blush yet, I did get this cute tint from Too Cool For School. The milk tint lives up to its name in that it actually contains milk! Supposedly this helps soften dry lips. The packaging: Simple and adorable! I really love the font and the milk bottle on the front. The pigmentation: It's pretty sheer, although with 'milky' being in the product's name means I probably should have expected it to be. I do have to build it up before the colour becomes noticeable on my lips. The application: It has a very small doe foot applicator which makes it easy to apply. The watery texture also makes it easy to spread out. The colour: After about 2-3 coats, I really like the subtle purple colour this gives my lips. At first I wasn't sure how I felt about it since I've never tried a colour like it before. However, I have warmed up to it as it's a pretty cute shade. The road test: This tint does not cooperate with dry skin on the lips so make sure your lips aren't chapped before applying. Once it's on, it isn't drying and it even feels quite softening. I guess the milk works! On the downside, I didn't find this to be very long lasting. Overall: This tint has been a welcome addition to my collection of mostly dark coloured lip products. Despite not being 100% sure with the shade at first, I am really happy with it now. I only wish it had some more staying power on my lips. Great Post! Your post are so good. Just love to read them. lets follow each other on GFC, Google+, Twitter, facebook, Instagram and Bloglovin? If yes, follow me and mention it by commenting on my blog. Would instantly follow back as soon as I see it. Stay in Touch. Omg I also have a thing for lavender makeup products!!! And I have such a similar product to this, only it's by Etude House.